between the two leading parties. 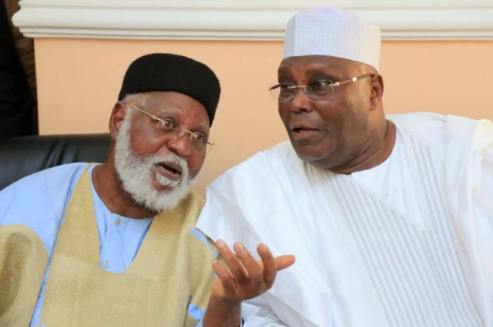 Presidential candidate of the Peoples Democratic Party, Atiku Abubakar, and the National Chairman of the party, Prince Uche Secondus, have shown video clips of alleged rigging of the February 23 presidential and National Assembly elections in the country to members of the National Peace Committee headed by a former Head of State, Gen. Abdulsalami Abubakar (retd.). They presented the videos in Abuja on Thursday night. Among those who watched the clips with the former head of state were Cardinal John Onaiyekan and Bishop Matthew Hassan Kukah. 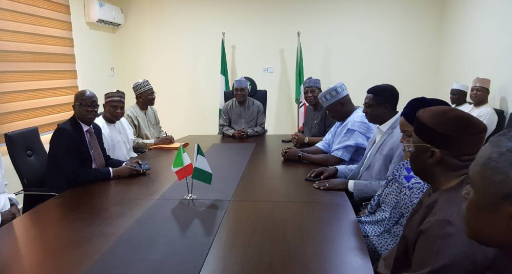 PDP members who were at the meeting, which held at the Asokoro, Abuja residence of the former vice-president, included the PDP vice-presidential candidate, Peter Obi; President of the Senate, who is also the Director-General of the PDP Presidential Campaign Council, Bukola Saraki; and the Speaker of the House of Representatives, Yakubu Dogara. It was gathered that Abdulsalami had been trying to meet with Atiku and his team since the announcement of the election results by the INEC Chairman, Prof. Mahmood Yakubu, in Abuja in the early hours of Wednesday. The former vice-president and his party had rejected the results and said they would seek redress in court. At the meeting with the Abdulsalami-led committee on Thursday night, investigations by The Punch showed that Secondus narrated to the NPC members how the members of the PDP were allegedly molested and denied the opportunity to cast their votes in many states. It was also gathered that Abdulsalami and members of his committee were shown video clips of how soldiers allegedly brutalised PDP members in some states and the sacking of some polling units by thugs suspected to be loyal to the ruling party without the security agents who were present taking any action. The video clips were said to have been watched by other NPC members in attendance. A source, who was at the meeting said, “At a point during the meeting, we decided to show video clips of how soldiers helped the APC to rig the elections in some states. We also showed them how security agents looked the other way when thugs invaded polling and coalition centres in some states. “We asked the retired General whether that was how he used the military to conduct the 1999 elections. But instead of replying, he laughed and laughed. I think he was trying to tell us that he is a different person or something like that. It was also learnt that Obi, who is a former governor of Anambra State, said he had to leave his home in his state on the eve of the election because of the activities of security men who allegedly terrorised his area. It was gathered that Atiku told the NPC members that he was surprised that they did not do anything despite all the issues raised by his party after he joined President Buhari to sign the peace agreement. He was said to have claimed that the country was already divided and that he regretted signing the peace agreement because of the events that unfolded after. “At a time, the Waziri (Atiku) became emotional. He said he regretted signing the Peace Agreement because members of the committee did not attend to complaints by the PDP after its signing and before the conduct of the elections,” another source added. He said, “The issue of Atiku Abubakar and his party’s recourse to legitimate actions to reclaim his stolen mandate was not discussed at the meeting. Atiku restates that as a democrat, he will follow laid-down constitutional and democratic procedures to challenge the electoral malfeasance committed by the APC in cahoots with the INEC. The National Chairman of the PDP, Uche Secondus, on Friday said the party had assembled more than 18 lawyers to go to court to contest the declaration of the presidential candidate of the All Progressives Congress, President Muhammadu Buhari, as the winner of the February 23 presidential election.